It's not exactly a Waiting for Wednesday, per se, being that today is Thursday and all. But, because of the long holiday weekend this past week, new books did not ship to comics shops yesterday. So, if you got laughed at because you went to your LCS, giddy as can be for new books, then I apologize. Nathaniel, however, does not. Apologize, I mean. He can be cruel sometimes. But fear not, because new books ship out today and soon you, too, will be awash in geeky goodness. 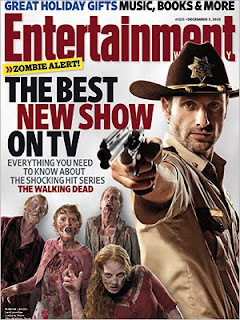 But before we get to the new and shiny, let's talk (again) about AMC's The Walking Dead. Because it is--officially, and pardon the pun--a monster hit. Record ratings, record numbers of re-airings, and with the season finale set for this coming Sunday night, there's no sign of stopping this zombie apocalypse. For the life of me, I can never understand why comics properties become such massive hits in other media, while the books themselves putter on with a small (but dedicated) fan base. Sure, The Dark Knight was a great film, but the comics from which the story was derived are pretty good, too. Fortunately, in the case of Walking Dead, I've heard that there has been a rather large uptick in sales of the collected editions, which is a great thing. It just begs the question, though--if zombies are so hot, and if these characters are so endearing to so many people, then why aren't the books more popular (to a wider audience, I mean) in the first place? Is it the stigma that's still attached to reading comic books? That's the easy answer, for sure. But what if it's something inherently wrong with the comics companies themselves? Marvel Comics, as a brand, is quite mainstream. Marvel comics, as, um, a bunch of comics that ship out to comics shops every Wednesday to a relatively small number of people? Not so much. Why is it that Marvel films are advertised to no end in Marvel's comics, but not vice versa? Less money allotted to the comics division, yes? Well, fine, but what about the backing of Disney? With all the Marvel shows on Disney's networks, why doesn't Disney push Marvel's comics? Why doesn't Image ante up and pay for an advertisement during The Walking Dead? Sure, it'll be expensive, but you have to spend money to make money, right? Don't get me wrong--I love the fact that comics properties are so mainstreamingly featured on TV and in theaters. That's a good thing for comics. But it could be a better thing, I think. Well, anyway. Let's get on to the actual comics. Someone has to, right? First up, we have a cool offering from DC/Vertigo in their reprint collection, Winter's Edge. This collection pulls from the (I think) three Winter's Edge books released by Vertigo over the years, and includes stories by some of their best creators. 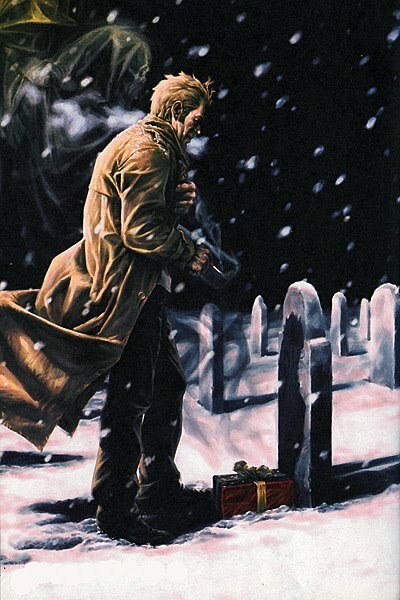 Each story features Vertigo mainstays like John Constantine (Hellblazer), Swamp Thing, and Tim Hunter (Books of Magic), and each has a winter/holiday theme. In time for the frigid depths of winter are ten previously uncollected short stories from the pages of VERTIGO WINTER'S EDGE – the timeless Vertigo title that featured comics' most select and sensational creators tackling the imprint's most enduring characters. Featuring The Endless, Swamp Thing, John Constantine and Tim Hunter in stories by Neil Gaiman (SANDMAN), Brian K. Vaughan (Y: THE LAST MAN), Dave Gibbons (WATCHMEN), Garth Ennis (PREACHER), Paul Pope (BATMAN: YEAR 100) and many, many more! Keep in mind that the price is steep--$7.99--because there's 96 pages of story. This is one of those books that I'll buy and keep on the shelf until Christmas Eve and read it along with the other holiday comics that I'll amass during December. Next up, we have...well, actually. Ya know what? That's really the only book I'm excited about this week, so I'll stop there. And I'll encourage anyone looking to try something new--to exfand their horizons, if you will--to go ahead and give this book a chance. No tights, no capes, but definitely some good, comic book stories. So check it out. Speaking of out, I need to get a move on. But before I do--what are you Waiting for? I'm more of a watcher than a reader to begin with, but I think your idea of airing an advertisement for the comic during the television series is a great one. Everyone knows (then again, maybe not) that it's based on a comic book, but even if you like the show, there's not much of an impetus present to make the jump. "I'm watching the show, that's good enough." And as much as I hate to admit this, consumers - impressionable as they are - need to be told what to do. "If you're enjoying The Walking Dead, read the comic book - available at a store near you!" Would go a long way, I think. The story in the show and comic are completely different, so people may be more into the show's presentation than the comic's. Part of the turn-off of the comic may be that it's not only black and white, but also a bit stylized and gore-iffic. Essentially, I think they're so far apart that you have no guarantee that anything (ANYTHING) that happened in the comic will happen in the show, now.